The take home is that it is never a good idea to breath toxins on a regular basis, and until pretty recently we were pretty relaxed about all that. This piece of work tells us that in which breathing wood smoke was pretty well unavoidable (pre 17th century), that cancer was rare. Alternative explanations are pretty well eliminated. We are now entering a global system in which such casual toxin exposure will disappear. The big one caused by the use of cigarettes has already been hugely reduced. The next one will be the transition away from fuel based automobiles. After that a few simple tweaks and it will be almost impossible to be exposed. Of course, food additives are drummed as a concern as well they should be. Yet little compelling evidence for risk actually exists. As Dr Al Sears points out, our bodies are quite able to handle minor insults and we help it along by properly topping up with ten grams or so of vitamin C, two grams or so of vitamin D and bit of CoQ10 (or a steak). Plenty of literature has already made this protocol stand out. Now we know clearly what causes cancer and know that a strong cellular system protects oneself. Cancer. Just the word evokes fear. The medical journals and newsletters I get are often filled with articles about cancer. It’s the 800-pound gorilla in the room. Once someone mentions it, it’s all you can think about. And if you’re a regular reader, you probably won’t be surprised that most of the cancer-related articles in medical publications are only about drug treatments. I’ve even read research on whether or not aspirin prevents cancer. I wonder who’s sponsoring those studies … Are they really trying to tell us that people are getting cancer because of a deficiency of aspirin? The truth is, cancer rates are not rising because we’re deficient in man-made painkillers. Cancer is increasing because of our man-made toxic environment. Cancer was almost unknown in ancient times. Why is this good news? Because it means you don’t need any scary science to prevent it. In a study completed just recently and published in the journal Nature, researchers looked at tissue samples from hundreds of Egyptian mummies. There should have been evidence of cancer in all of them, according to modern cancer statistics. And mummification would have preserved any sign of tumors. But instead of finding cancer in nearly every mummy … they found only a single case. The hundreds of other mummies showed no sign of cancer at all. These results would be impossible if cancer were not an entirely modern plague. Statistically, it could not happen. And it wasn’t because Egyptians didn’t live long enough to get cancer. The mummies had evidence of age-related problems like brittle bones and hardened arteries. What we should be doing today is trying to mimic the environment we had back then. That’s what we should be paying attention to. Researchers from some of the largest institutions in Texas are trying to help. They recently revealed how cancer begins. It starts with weakened cells. What happens today that did not happen in out native environment is that those breaks occur a lot more often. They’re caused by things like environmental pollutants and chemical ingredients in food. Our bodies haven’t adapted to the huge increase in these man-made toxins over a very short period. So let me be as clear as I can: Cancer isn’t a “normal” part of life. Toxins and chemicals are interfering with your natural ability to defend yourself. The most important thing you can do is to strengthen your cells, so they’re more disease-resistant. And that means making sure your body has the energy and the nutrients to repair and maintain those cells. The three most important nutrients you need to keep your cells strong are also the ones chronically deficient in today’s world. They are vitamin C, vitamin D and CoQ10. 1. Vitamin C is an antioxidant that disarms damaging free radicals before they can attack healthy cells and stimulate tumor growth. We also now know that the protective caps on the ends of your DNA, called telomeres, are very sensitive to this kind of damage. The shorter your telomeres, the older your cells act and the more susceptible they are to becoming cancerous. The new, exciting discovery about vitamin C is that it’s very effective at defending you against this process and protecting your DNA. We get some vitamin C from our food, but not nearly enough. The foods with the most vitamin C include dark green, leafy vegetables, and “superfruits” like the acerola cherry. Also, you probably don’t think of them this way, but peppers are the kings of vegetable vitamin C. Watercress is also a little-known but rich source of vitamin C. If you choose to supplement, try to get 1,500 mg twice a day if you’re healthy. If you’re under a lot of stress, or if you are sick, you can take as much as 20,000 mg per day. The best source of vitamin D is sunshine. Your skin produces vitamin D when the sun’s rays shine on you. Ten to 20 minutes of sun get’s you a full day’s supply of it. To supplement with vitamin D, make sure you take the natural form, D3. I recommend at least 2,000 IU per day. 3. CoQ10 is one of the most overlooked nutrients. The government doesn’t even have a recommended daily intake for it. But it’s the fuel your cells use to make energy. That means it’s the primary source of energy for the immune cells that get suppressed by cancer. CoQ10 restores their ability to fight back and attack cancer cells. Like vitamin C, it’s also a powerful antioxidant that blocks free radicals from damaging your DNA. Besides helping to prevent cancer, there are many clinical trials in which CoQ10 helps heal people who already have cancer. In one, researchers in Denmark studied a group of breast cancer patients. They gave them CoQ10, plus a combination of other antioxidants and essential fatty acids. The entire group had a partial remission of the cancer. Two of the patients received larger doses of CoQ10 (390 mg) and their tumors disappeared.7 In no way am I saying stop your cancer treatment and only take CoQ10. What I am showing you is the power of this important nutrient against cancer. The best way to get CoQ10 is by eating red meat from grass-fed animals. Grain-fed meat is not a good source of CoQ10. If you want to supplement, the form you get is very important. I recommend 50 mg of the ubiquinone form, which is 8 times stronger and is better absorbed than the old form. Why was cancer detected in only one in a few hundred Egyptian mummies? Why is there such scarce reference to cancer in ancient Greek or Egyptian texts? A study carried out by researchers from the University of Manchester, England and published in Nature suggests that cancer, especially cancer among children and young adults is not simply due to our living longer these days – it must be a man-made disease. The scientists say theirs is “the first histological diagnosis of cancer in an Egyptian mummy”. Investigators at Manchester University’s KNH Centre for Biomedical Egyptology say their study proves that during the Egyptian mummies’ time, cancer was extremely rare. After investigating hundreds of mummies, they came across just one case of cancer – worldwide only two cases have ever been detected. Incidence of cancer, especially childhood cancer exploded after the Industrial Revolution. In industrialized societies, cancer is second only to cardiovascular disease as a cause of death. But in ancient times, it was extremely rare. There is nothing in the natural environment that can cause cancer. So it has to be a man-made disease, down to pollution and changes to our diet and lifestyle. The important thing about our study is that it gives a historical perspective to this disease. We can make very clear statements on the cancer rates in societies because we have a full overview. We have looked at millennia, not one hundred years, and have masses of data. Professor Michael Zimmerman, a visiting professor at the KNH Centre, made the first ever histological diagnosis of cancer in an Egyptian mummy. The mummy was said to be an ordinary person, from the Ptolemaic period. In an ancient society lacking surgical intervention, evidence of cancer should remain in all cases. The virtual absence of malignancies in mummies must be interpreted as indicating their rarity in antiquity, indicating that cancer causing factors are limited to societies affected by modern industrialization. The investigators examined literary evidence from ancient Greece and Egypt, as well as mummified remains from ancient Egypt. They also carried out medical examinations of animal and human remains further back in history, as far back as the period of the dinosaurs. * According to animal, non-human primates, and early human remains and fossil evidence, cancer was extremely uncommon. One Edmontosaurus fossil of unknown primary origin had evidence of metastatic cancer. * Virtually all evidence of tumors, which were extremely uncommon anyway, were benign. * The few malignancies were found were in non-human primates, but none of them are cancers found in modern adult humans. Atherosclerosis, Paget’s disease of bone, and osteoporosis did exist in ancient Greece and Egypt – diseases that affect humans when they are older; old enough to develop common modern cancers. If humans at that time lived long enough to develop those diseases, the extreme rarity of cancer cannot be put down to very short life spans. People in those days lived long enough to develop the cancer adults develop today. Also, there is no evidence of any childhood cancers in ancient Greece or Egypt. Cancer among children is definitely much more common today than it was in ancient Greece/Egypt. Some people have suggested that tumors do not preserve well, so evidence of them disappears over time. However, Zimmerman says mummification preservers malignancy features; in fact, it preserves tumors much better than normal tissue. Of all the hundreds of mummies examined all over the world, just two have microscopic evidence of cancer. Radiologists have examined all the mummies at museums in Cairo and Europe and found no evidence of cancer at all. Evidence of cancer and medical procedures, such as operations for cancers does not appear until the 17th century, the researchers reveal. Scientific literature depicting distinctive tumors have only been about for the last 200 years, when data started to be documented about chimney sweeps with scrotal cancer in 1775, nasal cancer in snuff users in 1761, and Hodgkin’s disease in 1832. Where there are cases of cancer in ancient Egyptian remains, we are not sure what caused them. They did heat their homes with fires, which gave off smoke, and temples burned incense, but sometimes illnesses are just thrown up. 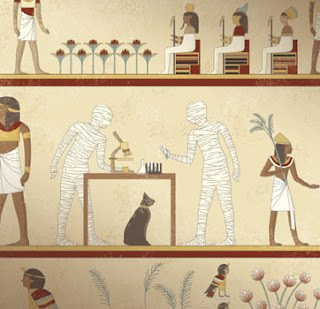 The ancient Egyptian data offers both physical and literary evidence, giving a unique opportunity to look at the diseases they had and the treatments they tried. They were the fathers of pharmacology so some treatments did work. They were very inventive and some treatments thought of as magical were genuine therapeutic remedies. For example, celery was used to treat rheumatism back then and is being investigated today. Their surgery and the binding of fractures were excellent because they knew their anatomy: there was no taboo on working with human bodies because of mummification. They were very hands on and it gave them a different mindset to working with bodies than the Greeks, who had to come to Alexandria to study medicine. (Conclusion) Yet again extensive ancient Egyptian data, along with other data from across the millennia, has given modern society a clear message – cancer is man-made and something that we can and should address. This is one of those results that make no particular sense at all. It does confirm the existence of a long term cycle and provides another datum for science to track for a century or two. I would anticipate a reversal sooner or later and that may make all clear or not. For the nonce, lianas are getting the upper hand. So for now we have some data and the apparent need to collect a lot more over a long time and the need to fit this into our knowledge of forest life cycles. Why are vines overtaking the American tropics? (PhysOrg.com) -- Sleeping Beauty's kingdom was overgrown by vines when she fell into a deep sleep. Researchers at the Smithsonian in Panama and the University of Wisconsin at Milwaukee received more than a million dollars from the U.S. National Science Foundation to discover why real vines are overtaking the American tropics. Data from eight sites show that vines are overgrowing trees in all cases. "We are witnessing a fundamental structural change in the physical make-up of forests that will have a profound impact on the animals, human communities and businesses that depend on them for their livelihoods," said Stefan Schnitzer, research associate at the Smithsonian Tropical Research Institute in Panama and associate professor at the University of Wisconsin at Milwaukee. Tropical forests hold more than half of the Earth's terrestrial species and much of the planet's carbon. If vines take over tropical forests the rules used to model ecosystem services, such as regulation of the water cycle and carbon storage may no longer apply. "In 2002, Oliver Phillips, a professor at the University of Leeds in the U.K., published a controversial study claiming that vines were becoming more common in the Amazon," said Schnitzer. "By pulling together data from eight different studies, we now have irrefutable evidence that vines are on the rise not only in the Amazon, but throughout the American tropics." On Barro Colorado Island in Panama, the proportion of vines in tree crowns has more than doubled over the past 40 years. In French Guiana, liana vines increased 60 percent faster than trees from 1992 to 2002. Similar reports from Brazil, the Bolivian Amazon and subtropical forests in South Carolina in the United States confirm that vines are becoming more common and represent more of the total forest biomass. Trees have huge woody trunks that take a lot of time and energy to produce. 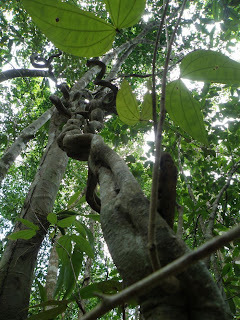 Vines take advantage of trees, growing quickly on slender stems up into the forest canopy, where their leaves may compete for light with the leaves of the trees that support them. There is still no consensus as to why lianas are gaining the upper hand. They may survive seasonal droughts that are becoming more common as climate becomes more variable. They may recover more quickly from natural disturbances such as hurricanes and El Niño events and from human disturbances like logging, clearing land for agriculture and road building. Lianas respond quickly to an increase in atmospheric carbon dioxide—growing faster than associated tree species in several experiments. In North American forests, invasive vines such as kudzu, oriental bittersweet, English ivy and Japanese honeysuckle often reduce native tree regeneration and survival, although there is no obvious trend as there is in the American tropics. In contrast, two studies of forests in tropical Africa did not detect vine overgrowth. To understand the nature of this contemporary spell that has been cast on the tropical forests of the Americas, the authors propose to take advantage of the widespread network of large-scale, long-term monitoring plots — the Smithsonian Institution Global Earth Observatory network coordinated by the Center for Tropical Forest Science — combined with experiments to reveal what gives vines a competitive edge over trees. Business models for investment in climate-mitigation schemes through carbon storage, climate models and water availability all rely upon accurate information about tree growth and cover in tropical forests. The major physical transformations indicated by this research call the reliability of such models into question. More information: Schnitzer, S.A. and Bongers, F. 2011. Increasing liana abundance and biomass in tropical forests: emerging patterns and putative mechanisms. Ecology Letters. Doi:10.1111/j.1461-0248.2011.01890.x For online publication on 14 Feb. 2011. Well maybe. I think there is plenty of opportunity in basic organic chemistry to form coated water droplets that have sufficient integrity to cook up something strange. Also recall the work done mixing elementary chemicals in ice fractures for decades. Clay itself is certainly useful and suggestive since it is degraded volcanic ash which contains a lot of solid crystalline acids to act as hammer and forge to produce more complex molecules. My point is that a clay particle is capable of strongly inducing chemical reactions. Thus it is a natural driver for the creation of a protocell, but more like a catalyst than a structural template. I think we are on the right track to experimentally produce protocells that are able to mimic some of the key functions of a cell. Fatty-acid liposomes compartmentalize inside a clay vesicle. Credit: Photo courtesy of Anand Bala Subramaniam, Harvard School of Engineering and Applied Sciences. A team of applied physicists at Harvard's School of Engineering and Applied Sciences (SEAS), Princeton, and Brandeis have demonstrated the formation of semipermeable vesicles from inorganic clay. The research, published online this week in the journal Soft Matter, shows that clay vesicles provide an ideal container for the compartmentalization of complex organic molecules. The authors say the discovery opens the possibility that primitive cells might have formed inside inorganic clay microcompartments. "A lot of work, dating back several decades, explores the role of air bubbles in concentrating molecules and nanoparticles to allow interesting chemistry to occur," says lead author Anand Bala Subramaniam, a doctoral candidate at SEAS. "We have now provided a complete physical mechanism for the transition from a two-phase clay-air bubble system, which precludes any aqueous-phase chemistry, to a single aqueous-phase clay vesicle system," Subramaniam says, "creating a semipermeable vesicle from materials that are readily available in the environment." "Clay-armored bubbles" form naturally when platelike particles of montmorillonite collect on the outer surface of air bubbles under water. When the clay bubbles come into contact with simple organic liquids like ethanol and methanol, which have a lower surface tension than water, the liquid wets the overlapping plates. As the inner surface of the clay shell becomes wet, the disturbed air bubble inside dissolves. The resulting clay vesicle is a strong, spherical shell that creates a physical boundary between the water inside and the water outside. The translucent, cell-like vesicles are robust enough to protect their contents in a dynamic, aquatic environment such as the ocean. 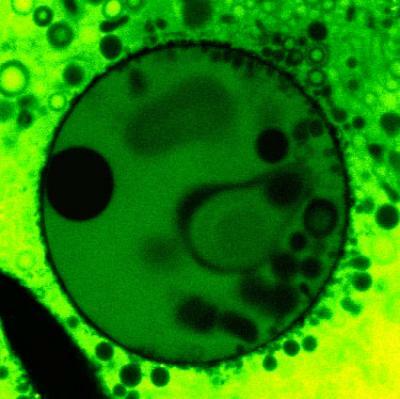 Microscopic pores in the vesicle walls create a semipermeable membrane that allows chemical building blocks to enter the "cell," while preventing larger structures from leaving. Scientists have studied montmorillonite, an abundant clay, for hundreds of years, and the mineral is known to serve as a chemical catalyst, encouraging lipids to form membranes and single nucleotides to join into strands of RNA. Because liposomes and RNA would have been essential precursors to primordial life, Subramaniam and his coauthors suggest that the pores in the clay vesicles could do double duty as both selective entry points and catalytic sites. "The conclusion here is that small fatty acid molecules go in and self-assemble into larger structures, and then they can't come out," says principal investigator Howard A. Stone, the Dixon Professor in Mechanical and Aerospace Engineering at Princeton, and a former Harvard faculty member. "If there is a benefit to being protected in a clay vesicle, this is a natural way to favor and select for molecules that can self-organize." Future research will explore the physical interactions between the platelike clay particles, and between the liquids and the clay. The researchers are also interested to see whether these clay vesicles can, indeed, be found in the natural environment today. "Whether clay vesicles could have played a significant role in the origins of life is of course unknown," says Subramaniam, "but the fact that they are so robust, along with the well-known catalytic properties of clay, suggests that they may have had some part to play." 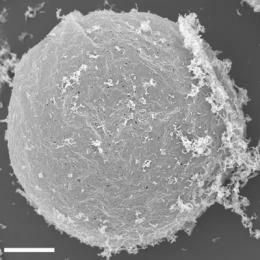 (PhysOrg.com) -- A team of applied physicists at Harvard's School of Engineering and Applied Sciences (SEAS), Princeton, and Brandeis have demonstrated the formation of semipermeable vesicles from inorganic clay. "We have now provided a complete physical mechanism for the transition from a two-phase clay–air bubble system, which precludes any aqueous-phase chemistry, to a single aqueous-phase clay vesicle system," Subramaniam says, "creating a semipermeable vesicle from materials that are readily available in the environment." The authors' schematic of clay vesicle formation, showing a cut-away view of the clay shell and dissolving bubble at the top, and a view of the water-air interface at the bottom. Credit: Image courtesy of Anand Bala Subramaniam, Harvard School of Engineering and Applied Sciences. This SEM image shows the exterior surface of a clay vesicle. Photo courtesy of Anand Bala Subramaniam. This is a reminder that plenty of ballasts using PCB still exist and that their failure often dumps PCBs into the atmosphere of the building. The device is typically removed quickly, but exposure is common. To be fair, all buildings should now be inspected for remaining obsolete ballasts and transformers that use PCBs. They are all long past replacement dates and are all waiting to fail only for replacement. There remains no good reason for them to be there. The likelihood of catastrophic exposure is low, except for the chap tasked for their removal when they do fail. No one has done a study on maintenance men for PCB exposure and their assorted ailments. As this item makes clear, the real and present danger is to a fetus in the womb. Yet later dangers may simply be unlooked for. If you do not ask you do not know. That applies to a host of chemicals that farmers in particular get exposed to. We have little reason to trust the self serving research that came from the companies who market these products. This coverage applies to all schools everywhere and is something everyone should be awake to. Simply asking about the last time all ballasts were replaced may be enough to complete the recycling of the old ballasts. Environmental Protection AgencyA ballast for a fluorescent lighting fixture that burst unexpectedly. As I reported last week, many parents in New York City are worried about the presence of the chemicals known as PCBs in light fixtures and caulking in school buildings. The latest spot inspection by the federal Environmental Protection Agency — on Jan. 29 at Public School 68 in the Bronx –- turned up lighting ballasts that were leaking PCBs above the regulatory level of 50 parts per million in 10 of 13 samples taken, the agency announced Monday. Over the past several weeks, the E.P.A. found similar contamination at all three other city schools that it inspected, too. For our Green blog readers, we submitted written questions to two experts at the Mount Sinai School of Medicine in Manhattan about any health risks faced by students and teachers. The following responses, edited for brevity, were provided by Dr. Maida P. Galvez, an associate professor in the school’s Department of Preventive Medicine and Pediatrics and the director of the hospital’s Region 2 Pediatric Environmental Health Specialty Unit, and Dr. Philip J. Landrigan, a professor of pediatrics who is chairman of both community medicine and the Department of Preventive Medicine as well as the school’s dean of global health. When did doctors awaken to the dangers of PCBs, or ploychlorinated biphenyls? Medical and environmental concern about the long environmental persistence and possible effects on human health of PCBs first arose in the 1960s and 1970s and led to a federal ban on the manufacture of PCBs that was imposed in 1976 under the Toxic Substances Control Act. Unfortunately, PCBs had already become widespread in the environment by that time, and they remain with us today. What does the research tell us about health risks? Much research on PCBs has been conducted over the past three decades. Biomedical research on PCBs has documented that diet is today the principal source of human exposure. For most people, contaminated fish is one important source of dietary exposure. Other sources of exposure include PCBs in older building materials like caulking and fluorescent light fixtures. Fetal brain damage to babies in the womb is the most important human health effect of PCB exposure. Well-conducted, highly credible epidemiological studies demonstrate that babies born to mothers with elevated levels of PCBs in their bodies have diminished intelligence, as measured by decreased I.Q. scores. These effects on the fetal brain appear to be permanent and irreversible. Children and adults are much less sensitive to PCBs than unborn children. Many parents are fretting about the discovery of light fixtures in schools that are leaking PCBs. What would you tell people who fear that their children will suffer health effects from exposure to these toxic chemicals? Now that PCBs have been discovered in leaking light fixtures in schools, it is clear that faulty fixtures need to be removed to prevent further exposure of children, teachers and other school staff. But this situation is not a medical emergency. PCBs at the levels found in schools in New York City today will not make any child or any teacher acutely ill. There is no need for panic. There is time to measure, evaluate and take appropriately focused, intelligent preventive action. But there is also no excuse for delay in taking action. The goal is to keep environmental exposures low to minimize risk. Ensuring proper ventilation is another important measure that can reduce exposures to PCBs and improve other aspects of indoor air quality issues in classrooms. Ensuring adequate facilities and time for hand washing — especially before eating — is another important measure that can reduce exposures to PCBs. How much exposure would start worrying you? We are most concerned about exposures to pregnant teachers and other adult women of childbearing age in the schools because exposures to even low levels of toxic chemicals during pregnancy have been shown to have the potential to cause injury to the developing fetal brain. There are no safe thresholds for chemical exposure during pregnancy. I understand that it is difficult to provide certainty about any health risks, but is there anything that makes people susceptible to developing a disease because of exposure to PCBs? Is it related to weight? Age? Preschool students versus elementary or high school students? Unborn children in the mother’s womb are the group within the population at greatest risk of injury for the reasons detailed above. Young children may be at increased risk of exposure to PCBs because of age-appropriate hand-to-mouth behaviors. The air-level guidelines set by the E.P.A. take these factors into account and are more protective for younger classes than older ones. To avoid exposure, parents can familiarize themselves with sources and routes by which PCBs enter the human body. Diet is the most important of these exposure sources, and therefore it is especially important to avoid eating contaminated fish. Parents can check local fish advisories and follow guidelines on recommended fish intake. This is especially important for pregnant women and young children. Parents can also learn what products contain PCBs. If they find PCB-containing products in their homes like old electrical equipment, they should properly dispose of it and clean up spills or leaks immediately. When they are in doubt about how to dispose of such equipment, they should contact the city’s Department of Health or the E.P.A. existing fluorescent light fixtures in schools. Prompt cleanup of PCB spills and replacement of faulty equipment when possible will minimize children’s exposures to PCB containing materials. This type of work should be done when children are not present in the building. On a national level, advocating for reforms is key to this issue. We cannot continue, as we have for too long in the past, to allow chemicals to be placed in the environment only to wonder decades later whether there is a potential for harm to human health, especially for vulnerable populations including pregnant women and young children. Remember, PCBs are just one of many potentially concerning chemicals used widely. Some parents in Staten Island kept their children at home until the city replaced the light fixtures. Was this sensible or an overreaction, from your point of view? It’s often very difficult for parents to know what to do as these situations unfold. The take-home message for parents is that in conducting a pilot study, New York City is one of the first school districts in the country to address PCBs in the classroom. PCBs at the levels found in schools in New York City today will not make any child or any teacher acutely ill. In fact, compared with air levels reported in some other studies, air levels reported in NYC schools have been quite low. Therefore, in this particular instance we would say certainly send your child to school. The benefits of going to school far outweigh any risk from PCBs in the school environment. Are there other more general health risks related to attending public school in New York City? It can be very challenging for schools to decide which environmental concern deserves top priority and often requires a school-by-school assessment. The E.P.A.’s Tools for Schools Action Kit, available at , can help schools assess indoor air quality issues and ensure a healthy environment in school buildings. This is a call for the US to do something. At present, the US is standing passive and looking confused. In time it will need to act in support of a new regime. For the present been passive may just be the best answer. The Libyan people seem to be able to get the job done and they need the esteem builder. The Arab peoples elsewhere also need to see it unfold that way. Most everyone knows where the presidential palaces are and need no help to place pressure on the regime. The best an outsider can do is to assist in the escape. Actual intervention means that you end up owning the problem as was done in Iraq. Yes, we need to come out in favor of the people’s revolution now. This is the only president in the past forty years who seems to have to think about it at all in this particular case. This homicidal maniac ordered the Lockerbie atrocity and many others because he could. He only had second thoughts after Reagan reached out and touched him with an air strike. He only listened to wiser heads when his own sons grew up and finally convinced him of the stupidity of his ways. Land relief and aid support in the east and do not worry about arms. They are moving freely enough right now. Posted by Ryan Mauro on Feb 24th, 2011 and filed under Daily Mailer, FrontPage. You can follow any responses to this entry through the RSS 2.0. You can skip to the end and leave a response. Pinging is currently not allowed. Ryan Mauro is the founder of WorldThreats.com, the National Security Adviser for the Christian Action Network and an analyst with Wikistrat. He can be contacted at TDCAnalyst@aol.com. Muammar Qaddafi’s goal is obvious: If he goes down, he wants to bring Libya with him. He wants the day he falls to be remembered as a day of bloodshed, not of joy. His fighter jets are firing on protesters and a new report says he has ordered the destruction of his country’s oil facilities, which would eliminate 75 to 90 percent of the next government’s revenue and make the world feel his pain as oil prices skyrocket. It is time for the U.S. to step in. President Obama should have called for Qaddafi’s resignation days ago. If Hosni Mubarak qualified as a leader unworthy of office, then Qaddafi surely does as well. Yet, in the speech, Qaddafi’s name was not even mentioned. The Obama administration has made improving the image of the U.S. a top objective of its foreign policy but its failure to decisively side with the people dying for the rights we cherish is tarnishing it. 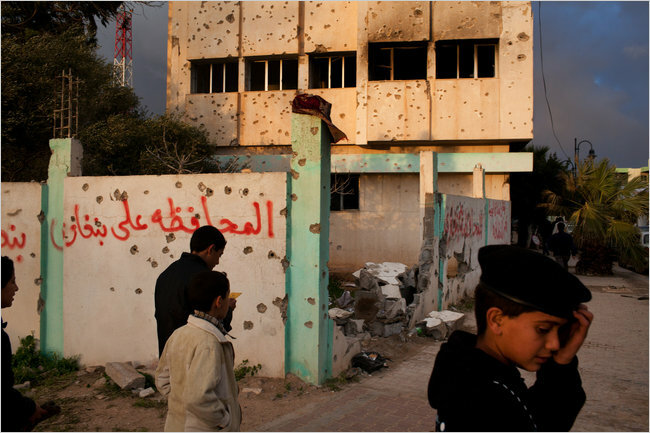 It is time to unequivocally stand in favor of the Libyan revolution. The U.S. and its allies should immediately reach out to any non-Islamist party or opposition leader in Libya, including the tribal chiefs, to begin forming a transitional government. This expression of confidence that Qaddafi will not last will do much to motivate the Libyan people. This transitional government, if put together before the dictator falls, should be given authority over liberated territory like Benghazi. The military and police who have defected can become part of the new security forces that can prevent anarchy, and elements of the regime that have embraced the revolution should be welcomed. Through this government, the West can deliver humanitarian supplies to bring relief to the conflicted areas. The creation of this body would help non-Islamist forces organize for the day when elections are held and would make for as smooth of a transition as possible. The U.S. must take the lead in the international community in warning that the names of anyone carrying out violence against the protesters are being collected and they will be prosecuted. The assets of any official who has not turned against Qaddafi should be frozen. Fighter jets being used to fire upon the Libyan people can be shot out of the sky, especially if Libyan airspace must be entered to evacuate staff and citizens. The mere threat of this would cause most, if not all, of the fighter pilots to go AWOL. The alternative is to watch Libyan protesters get massacred while they ask why the U.S. does nothing and time is given to Qaddafi to destroy his oil infrastructure. I am writing this Friday morning on the Pacific Coast as we continue to get snippets of news out of Libya. It is obvious that the rebellion is coalescing around Libyan army units who have deserted and have joined the rebellion. This allows a scratch defense to be thrown up anywhere an aggressive government force appears and they are beating of any assaults. A fair bet is that we will see everything around Tripoli secured before a major test of the pro government military strength takes place. There is a lot to do and there is also the possibility of many more defections taking place as government forces come to believe that the situation is hopeless. Thus a simple strangulation of the city through a siege is a very good present option, particularly if government forces have enough fight to repel a simple assault. In the end, it has become hopeless for Qaddafi unless he is able to establish a real perimeter that allows resupply and that presently looks unlikely, or at least it is now a real fight to do so. If the rebel military is sufficient and mobile enough, then they could break into Tripoli tomorrow and bring this whole thing crashing down. I suspect that they are still organizing and force concentration has not happened yet. Communication is effectively in the hands of the rebellion at this point and one must assume that they are still sorting out who is in and who is out in terms of a final assault. Once Qaddafi is able to count heads and understand that the majority of the army has deserted if that is true, then he will fold his tent and escape. Thus the real fight right now is for the hearts and minds of the officers and rank and file. We will know the tipping point when the military hunts down the mercenaries brought in by Qaddafi. All this takes some time that is cheap to provide while building up rebel strength. So if it does not end suddenly we will have a delay while the army sorts itself out. Then sooner or later it is over and can have only one outcome, whatever Qaddafi wants to believe. BENGHAZI, Libya — Rebels seeking to overturn the 40-year rule of Col.Muammar el-Qaddafi repelled a concerted assault by his forces on Thursday on cities close to the capital, removing any doubt that Libya’s patchwork of protests had evolved into an increasingly well-armed revolutionary movement. The series of determined stands by rebel forces on Thursday — especially in the strategic city of Zawiyah, near important oil resources and 30 miles from the capital, Tripoli — presented the gravest threat yet to the Libyan leader. In Zawiyah, more than 100 people were killed as Colonel Qaddafi’s forces turned automatic weapons on a mosque filled with protesters, a witness said. Still, residents rallied afterward. Colonel Qaddafi’s evident frustration at the resistance in Zawiyah spilled out in a rant by telephone over the state television network charging that Osama bin Laden had drugged the town’s youth into a rebellious frenzy. The violence on Thursday underscored the contrast between the character of Libya’s revolution and the uprising that toppled autocrats in neighboring Egypt and Tunisia. Unlike those Facebook-enabled youth rebellions, the insurrection here has been led by people who are more mature and who have been actively opposing the government for some time. It started with lawyers’ syndicates that have campaigned peacefully for two years for a written constitution and some semblance of a rule of law. Fueled by popular anger, the help of breakaway leaders of the armed forces and some of their troops, and weapons from looted military stockpiles or smuggled across the border, the uprising here has escalated toward more violence in the face of increasingly brutal government crackdowns. At the revolt’s starting point, in the eastern city of Benghazi, Fathi Terbil, 39, the human rights lawyer whose detention first ignited the protests, drew a map of rebel-held territory in striking distance of Tripoli. “It is only a matter of days,” he said. A turning point in the uprising’s evolution was arguably the defection of the interior minister, Abdel Fattah Younes al-Abidi, an army general who had been a close ally of Colonel Qaddafi. The break by General Abidi, who has family roots near the revolt’s eastern origins, encouraged other disaffected police, military and state security personnel to change sides as well. “We are hoping to use his experience,” said Mr. Terbil, who some called the linchpin of the revolt. Opposition figures in rebel-held cities like Benghazi have been appearing on cable news channels promising that opponents of Colonel Qaddafi are heading toward Tripoli to bolster the resistance there. Their ability to carry out those assertions remains to be seen. In parts of the country, the revolutionaries, as they call themselves, appear to have access to potentially large stores of weapons, including small arms and heavy artillery, automatic weapons smuggled from the Egyptian border and rocket-propelled grenades taken from army bases, like the Kabila in Benghazi. Tawfik al-Shohiby, one of the rebels, said that in the early days of the revolt one of his relatives bought $75,000 in automatic weapons from arms dealers on the Egyptian border and distributed them to citizens’ groups in towns like Bayda. So far, at least in the east, many of the weapons appear to be held in storage to defend against a future attempt by Colonel Qaddafi’s forces to retake the territory. At a former security services building in Benghazi on Thursday, men in fatigues prepared to transport anti-aircraft and antitank weapons to what one said was a storage depot. Like their counterparts in Tunisia and Egypt, the rebels in Libya have shown tech-savvy guile in circumventing government efforts to block their communication. To sidestep the government’s blocking of the Internet and curbing of cellphone access, for example, some of the more active antigovernment protesters distribute flash drives and CDs with videos of the fighting to friends in other towns and to journalists. Mr. Shohiby began helping lead an effort this week to shuttle foreign journalists from the Egyptian border to towns across eastern Libya. His network of contacts was built on the Internet: not on Facebook, but on a popular soccer Web site. “I have friends from east to west, north to south,” he said. “There are two guys in Sabha, one in Zawiyah, three friends in Misurata, for example,” he said, speaking of towns that were the scenes of some of the clashes on Thursday. Still, Mohammed Ali Abdallah, deputy secretary general of an opposition group in exile, The National Front for the Salvation of Libya, said the government’s fierce crackdown made organizing the spontaneous uprising a continuing challenge, especially in heavily guarded Tripoli. Nonetheless, protesters in Tripoli were calling for a massive demonstration on Friday after noon prayers, residents of the city and those fleeing the country said. In recent days, witnesses said, Colonel Qaddafi appears to have pulled many of his militiamen and mercenaries back toward the capital to prepare for its defense. But despite the encroaching insurrection, Colonel Qaddafi appeared determined on Thursday to put on a show of strength and national unity, a stark turnabout from his approach so far. Since the start of the uprising, his government had shut out all foreign journalists, cut off communications and even confiscated mobile phone chips, and other devices that might contain pictures, at the border from people fleeing the country. Libya had warned that reporters who entered the country illegally risked arrest and could be deemed collaborators of Al Qaeda. But on Thursday, Colonel Qaddafi’s son and heir apparent Seif al-Islam el-Qaddafi announced on television that the government would allow teams of journalists to visit Tripoli. Witnesses said preparations for the visit were already under way. But the rebels’ unexpected strength was undeniable on Thursday as they appeared to hold or contest several towns close to Colonel Qaddafi’s stronghold in Tripoli in the face of a coordinated push by his mercenaries and security forces. In Misurata, 130 miles the east of the capital, Colonel Qaddafi’s forces struck at rebels guarding the airport with rocket-propelled grenades and mortar shells, The Associated Press reported. But the rebels seized an anti-aircraft gun used by the militias and turned it against them. In Zuwarah, 75 miles west of the capital, the police and security forces had pulled out and a “people’s committee” was controlling the city, several people who had fled across the border reported. “The people are taking care of their own business,” said Basem Shams, 26, a fisherman. In Zawiyah, an envoy from Colonel Qaddafi had reportedly arrived to warn rebels on Wednesday: “Either leave or you will see a massacre,” one resident told The A.P. About 5 a.m. Thursday, Colonel Qaddafi’s forces fulfilled their threat. Witnesses said a force that included about 60 foreign mercenaries assaulted a central mosque where some of the roughly 2,000 protesters had sought refuge. One witness said the protesters were armed mainly with rifles, sticks and knives, but after four hours of fighting they managed to hold the square. About 100 people were killed and 200 were wounded, this witness said. During a telephone interview with him, a voice could be heard over a loudspeaker in the background telling the crowd, in an area known as Martyrs Square, not to be afraid. Meanwhile, the violence sowed concern across the region and beyond. President Obama spoke Thursday, in separate calls, with President Nicolas Sarkozy of France and the prime ministers of Britain and Italy, David Cameron and Silvio Berlusconi. The White House said the leaders expressed “deep concern” over the Libyan government’s use of force and discussed possible responses, without specifying what steps they were prepared to take. Kareem Fahim reported from Benghazi, and David D. Kirkpatrick from the Tunisian border with Libya. Reporting was contributed by Sharon Otterman, Mona El-Naggar and Neil MacFarquhar from Cairo, and Robert F. Worth from Tunis. Cold Weather Due to Iceland's Volcano?